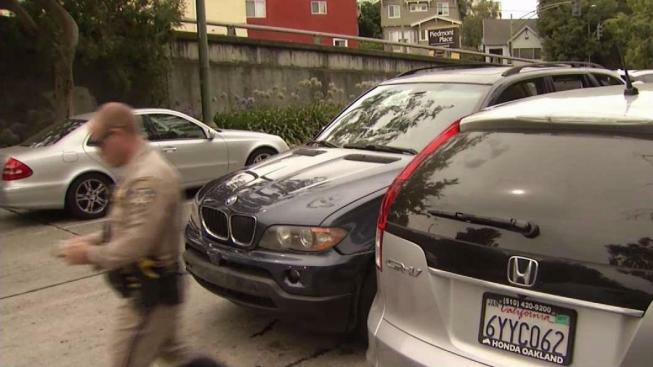 A suspect is in custody after a high-speed car chase from Pleasanton to Oakland on Thursday afternoon, according to the California Highway Patrol. James Sims, 30, of Antioch, was taken into custody without injury around 2:30 p.m. near the MacArthur Maze and Interstate 580, the CHP said. A CHP vehicle performed a PIT maneuver, ramming the suspect vehicle to turn it sideways, to end the chase. Sims had been driving the wong way on the freeway from Pleasanton and on Oakland surface streets before the CHP's maneuver, officials said. Sims was booked into Santa Rita jail for felony evasion, driving the wrong way on the freeway, possession of stolen property, and driving with a suspended license, the CHP said.